The company name ventopay was created as part of an effort to bring fresh wind (vento) into billing and payment (pay). We will gladly convince you with innovative solutions, clever products with state-of-the-art technology, refreshing ideas and optimal customer service. With 15 years of experience, ventopay is your specialist in the field of cashless cash register, payment and billing systems. With mocca®, ventopay offers a system of the highest quality, which is tailored to the special requirements of community catering. It can be used for company restaurants & caterers, universities & schools, stadiums & arenas as well as hospitals & care facilities and vending machine operators. Well-known customers in Germany, Switzerland and Austria are already successfully using the mocca® system. ventopay is an owner-managed company that is led by Mag. Christa Langer, Dr. Josef Langer and Ing. Johannes Reichenberger. The head office of ventopay is located in Softwarepark Hagenberg, one of the leading technology centers in Austria. 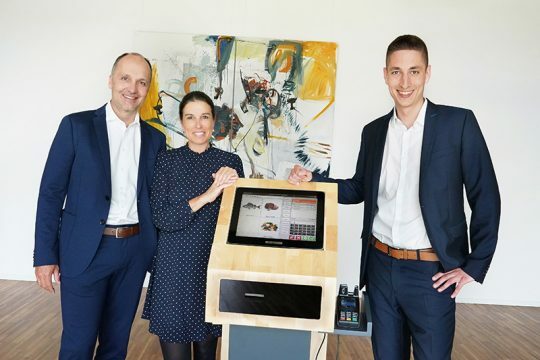 In 2015, a branch in Essen was founded with ventopay gmbh Germany, and since 2018 there has been a further company location in Augsburg. Together with ELEKTRON AG – our distribution partner for Switzerland -, the partner company Wabis and the service partner in Vienna, ventopay has a total of more than 60 branches in Germany, Austria and Switzerland. In the in-house development department at the Hagenberg site, the mocca® product line is constantly being developed and supplemented with new functions by a team of specialists. In addition, in-house development offers the opportunity to react quickly to individual inquiries and implement special developments. Before software updates are rolled out, they are thoroughly tested in our own quality assurance department. Project management and support are also located in Hagenberg. Your success is our goal. We want to make our customers successful by making the payment and billing processes in the community catering sector as efficient as possible. With the cashless payment system mocca® we accelerate payment, our management and reporting software simplifies billing and our innovative apps increase customer satisfaction and customer loyalty. We have no less claim than to offer you with mocca® the best system on the market. The basis for the success of ventopay are complete system solutions in which all main modules are developed. All components such as cash registers, machines, vending machine modules, apps and pre-order systems are fully integrated in the mocca® system. Thus we guarantee quality, reliability and smooth processes in the company catering. In addition, administration and billing are quick and error-free due to the common database. As a customer, you only have one single contact that can recognize your requirements and efficiently solve possible problems. Annoying coordination with interfaces between several companies is therefore a thing of the past.